THE MAIN AMBITION OF THE LABEX FCD IS TO CHANNEL FUNDING TO SUSTAINABLE OBJECTIVES. LABEX FCD is a French networked research centre that brings together the best research teams in mathematics, economics and management. These teams work within Chairs and Research Initiatives affiliated to the Risk Foundation (FDR), Europlace Institute of Finance (EIF) and the Dauphine Foundation. Increasing the budget of a Research Initiative with a view to it becoming a Research Chair (funding between €250,000 and €300,000). Each project validated by the Scientific Executive Board will receive €75,000 over a 12-month period. One third of this amount, i.e. €25,000, will be used during the year for promotional activities with regard to potential financial partners. The remaining €50,000 will be awarded in the event of successful fundraising in that particular year. If the fundraising operations are not successful, the remaining amount will be earmarked for another project. Application form can be downloaded through this link. Applications may be submitted throughout the year for the closing dates 28 February and 30 November (inclusive). Only labelled Chairs and Research Initiatives will benefit from the main operations implemented by Louis Bachelier Finance and Sustainable Growth LABEX. 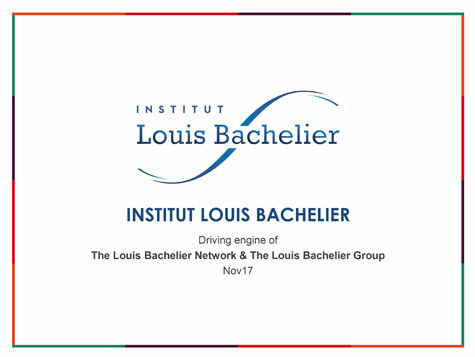 Additional funding of up to €5,000 is provided by the Louis Bachelier LABEX for the organization of colloquiums, conferences and summer schools in direct connection with its research axes. The organizing committee must include several researchers attached to the ILB programme. A scientific committee must be set up, and will include recognized external members. A call for papers must be made, along with provision for attending the conference. Particular attention will be given to conferences lying within the framework of the recurring international circuit of key conferences. Recipients of assistance undertake to submit a financial and scientific report (final programme, participation, etc.) within a short time after the event. Applications may be submitted over the year. €5,000 of funding is available to enable foreign researchers to attend the seminar. Applications should be submitted up to and including 30 April. The aim of Louis Bachelier LABEX mobility aid is to help researchers enrolled in one of the partner institutions by offering them financial support for a research project abroad (post-doc, sabbatical year or semester, etc.). An amount between €5,000 and €10,000 is awarded to each of the candidates selected. Applications may be submitted up to and including 26 Mars. Organized in the form of congresses, conferences and advanced courses, and involving the invitation of foreign researchers, Thematic Semesters aim to encourage exchanges between academics and professionals on a theme appropriate to the Louis Bachelier Finance and Sustainable Growth LABEX. This theme must be sufficiently transversal to allow the participation of various research programmes in finance, economics, management, mathematics and insurance. The application form can be downloaded through this link. Applications are assessed throughout the year for the closing dates 31 March and 30 October. The duration of the contract is between 18 and 24 months. The proposed grant is part of a co-financing process with the relevant research programme.